Toledo was once the capital city of Spain back until the 16th century and is now probably the most popular day trip from Madrid. Its historical influence from Jewish, Catholic and Muslim cultures is its main draw with the remaining mosques, synagogues and cathedrals echoing what was once a diverse, multi-religious capital city. 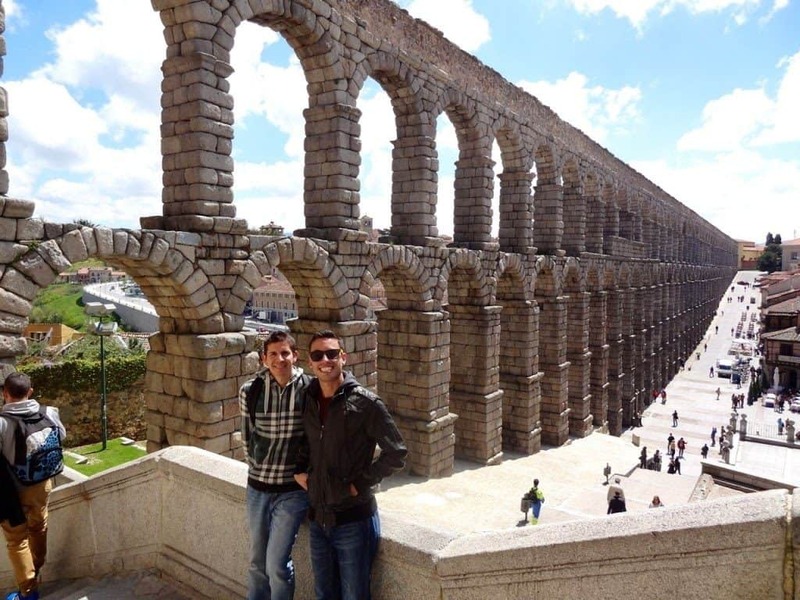 The town is located at the top of a steep hill 70 kilometers south of Madrid. It’s well connected by a 45 minute bus ride for €10 or a 30 minute train ride for €13 one way. 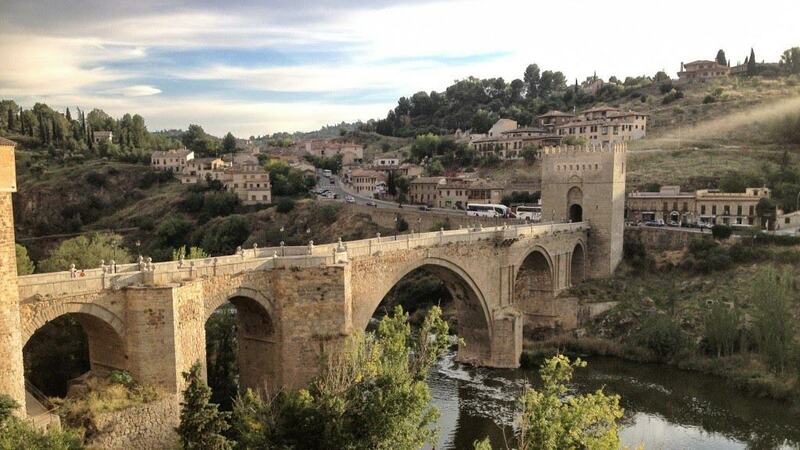 This town is one of our personal favorites for spending the day outside Madrid. Segovia is a beautiful city and most well known for its first century Roman Aqueduct which spans across the entrance of the city offering an impressive view from Plaza del Azoguejo. Another popular attraction is the Disney-like 12th century castle on the northwest end of the town known as the Alcazar of Segovia. Originally built as a fortress, it’s been used for many purposes since its construction. Today it’s a museum and a military archives building. The town is most quickly and easily reached by taking the AVE, Spain’s high speed train. It’s a 30 minute trip from Madrid at a cost of about €13 one way. 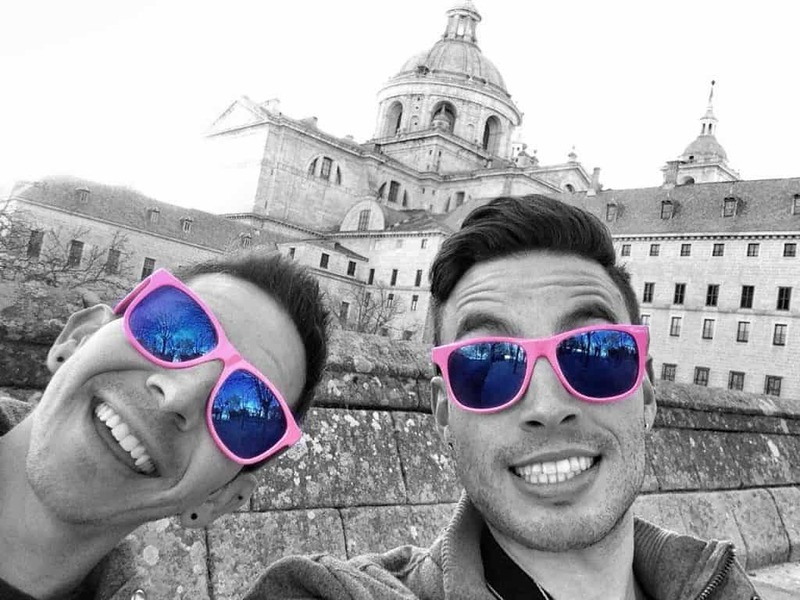 El Escorial, officially San Lorenzo de El Escorial, doesn’t have the medieval charm of Segovia or Toledo, but it’s still worth checking out for a calmer, more relaxing day trip out of Madrid. 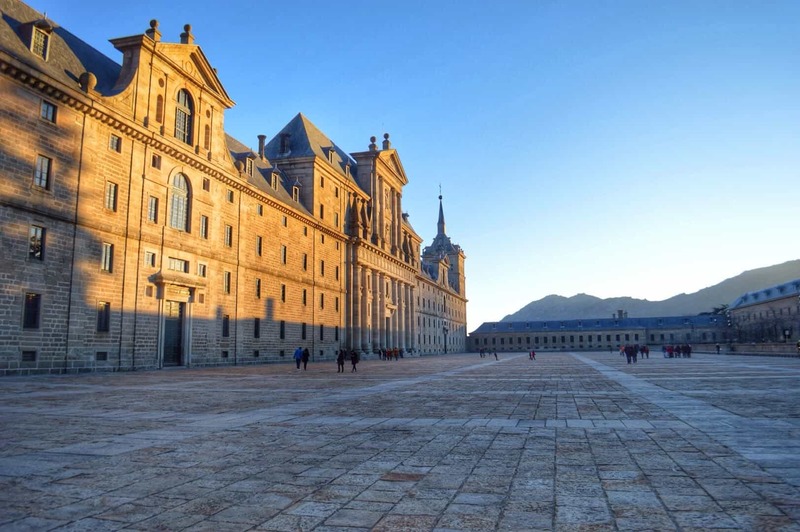 It’s most popular attraction is the Royal Site of San Lorenzo de El Escorial which operates under many roles. Constructed in the 16th century, it contains a church, monastery, royal palace, college and library. You can get there from Atocha Station in Madrid in just over an hour for about €3. Another popular site in El Escorial is El Valle de los Caídos or The Valley of the Fallen. This monument and basilica was built under Franco to honor those who died during the Spanish Civil War. It’s a bit controversial as Franco is also buried there, but it’s an interesting look into Spanish history. The only way to get here via public transit is by bus 664 from Madrid or El Escorial. 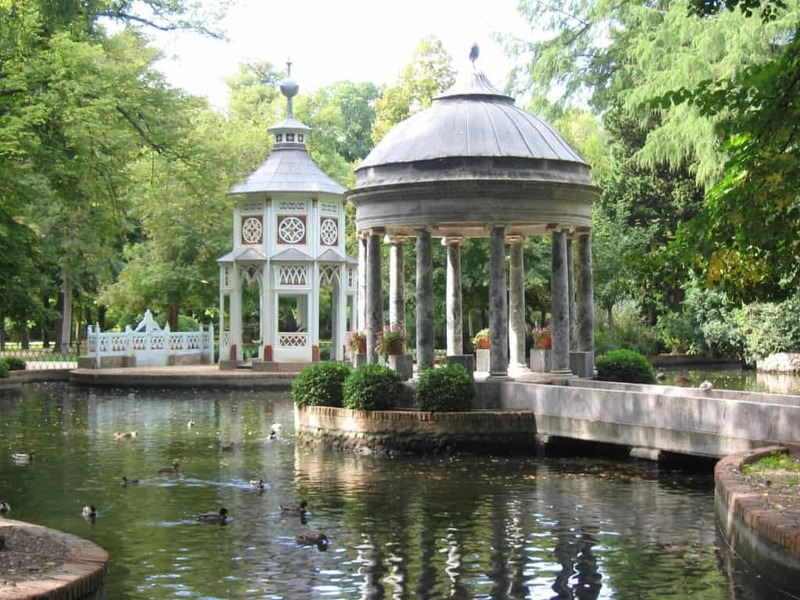 About 40 kilometers south of Madrid is the town of Aranjuez which was declared a UNESCO World Heritage Site in 2001. One of the main things to see here is the Royal Palace of Aranjuez, completed in the mid-18th century. Around the palace you’ll also find many beautiful gardens such as Jardín de la Isla and Jardín del Príncipe. During the summer, the Strawberry Train runs on the old train track between Madrid and Aranjuez and allows you to experience a fun ride (strawberries included) on an antique train. Tickets also include a guided visit to the gardens and palace. 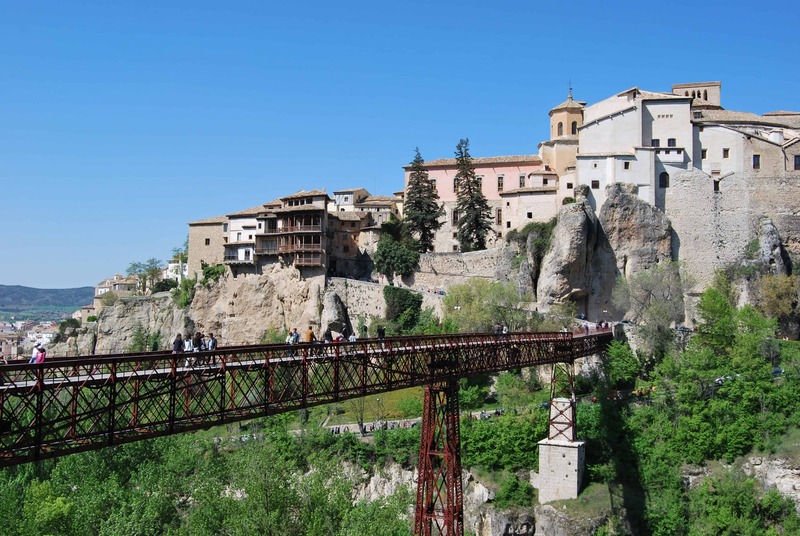 Cuenca is a historic walled city in the province of Castile–La Mancha founded by the Moors. Cobble stone streets and a medieval old town make this city an attractive option for a day trip. One of the most notable sites here are the casa colgadas, or hanging houses. They date back to the 15th century and are constructed on the side of a cliff over the Huécar River. Other sites of interest are the cathedral, the ruins of the Arab fortress and the Museum of Spanish Abstract Art. The fastest way to get to Cuenca from Madrid is to take the AVE which will get you there in just under an hour. However, this is also the priciest option with tickets at about €35 one way. The other option is a two hour bus ride with Avanza for about €15. Have you visited any of these towns outside Madrid? Which would you like to visit most? Let us know in the comments below.